I am so excited to be participating in a fun little giveaway today! I thought it would be fun to give away some of my favorite things that would make a nice little gift idea for the women in your life. The nice things about these Valentine’s Day Gifts for Her is that they are all under $20 and would be perfect for your girlfriends, sisters, mom or even yourself. These gifts are perfect to give to someone that needs just a little something extra in their life. Nothing too extravagant, but a gift the receiver will enjoy getting! A little practical and fun at the same time. Here is what is included in my gifts for her giveaway package. 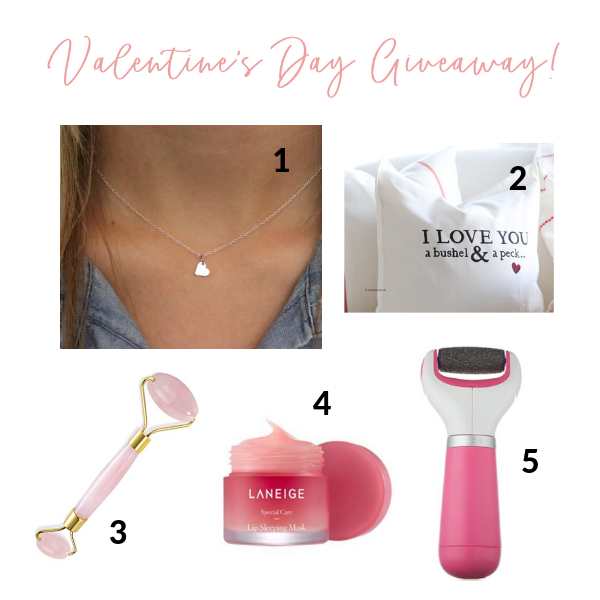 Tiny Heart Necklace– I love minimalist jewelry and this tiny heart necklace is the perfect necklace for Valentine’s Day. I love it so much I wear it all of the time. I also bought one for my girls to give to them for Valentine’s Day this year. Perfect also for any other time of year. Wouldn’t they be perfect for your bride’s maids or as a gift to a sister or best friend too? Bushel & a Peck Pillow Cover– I love this pillow cover. I actually shared it as a DIY project earlier. So you can make one too! Perfect for Valentine’s Day decor or a nursery! A fun piece to display in your home year round. Pink Jade Facial Roller– I was a little skeptical of this facial roller but received one from a friend this Christmas and I have been converted. I love how it feels on my swollen and puffy face first thing in the morning! It feels so fancy and luxurious! Laneige Lip Mask– I love this lip mask and use it all day everyday! Leaves your lips feeling so soft and smooth and perfect in this dry winter air! I don’t go anywhere without it! I bought an extra one I loved it so much! Amope Pedi Perfect– This electronic foot file, gently & effectively buffs away your thick hard skin to reveal touchably smooth feet! It works so well and leaves your heels and feet so smooth. Perfect for getting your feet ready for summer sun and sandals! I love mine! Good Luck! To enter click here and go to my Instagram account. This is a giveaway we are hosting with 9 other bloggers. You can have a chance to win 9 other gift baskets. Fine print: Giveaway is not affiliated with Instagram. Each blogger is supplying their own gifts with their own personal funds. Giveaway will close January 31 at midnight EST. Winner will be announced on Instagram. Winner will be notified by DM on IG. If winner does not respond within 24 hours a new winner will be selected. That necklace! 😍 That pillow! 😍 I love it all! I’d love any of those!! I’ll have to pass this on to my hubby :) Thank you for sharing!